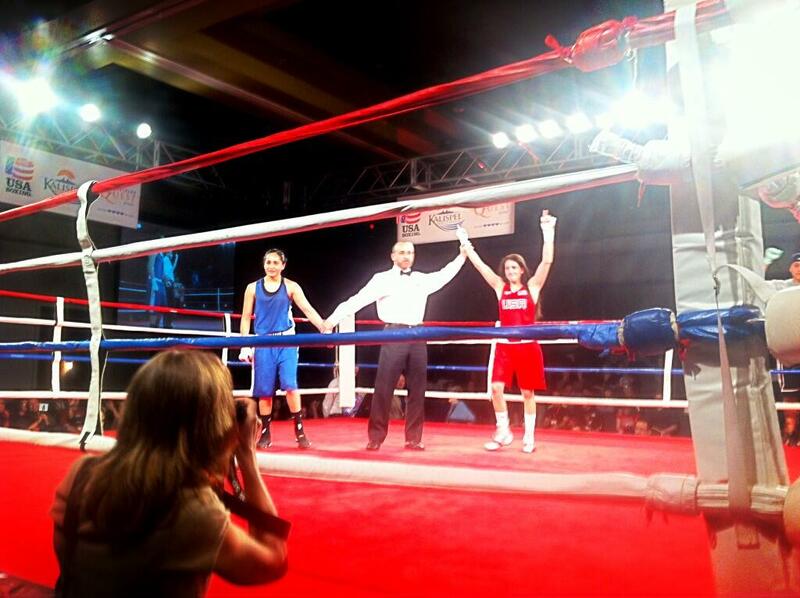 2013 USA Boxing Nationals Final Results! What a great night of boxing for the elite women in the competition! They fought tough, hard and strong with some returning champions and some newcomers getting the nod! To my mind, it is hard to choose which fights delivered the most, though I have to say that 30 year old, Christina Cruz delivered with a capital D, executing a smart, savvy game plan, in her bout against Ayanna Vasquez, setting up Cruz’s next challenge, that historic 7th NY Daily News Golden Gloves title. Olympian Queen Underwood’s four round non-stop battle against teammate and champion in her own right, Tiara Brown was nothing short of awesome. Both women fought their heart’s out trading hard shots, combinations and a yin-yang momentum that kept shifting. Still Underwood was able to pull out the close split-decision to claim the 132 lb. championship, but to my mind, both women came away women came away winners having put on a tremendous effort. Olympian Marlen Esparza also won by split decision after four rounds of a surprising and spirited defense from Virginia Fuchs in the 112 lb. weight class. Fans really got into the fight and actually booed when the decision was called. At 106 lbs, the two mighty-mights fighting for the championship, Elisha Halstead and Alejandra Mercado, set the tone for the night: two terrific boxers working everything they had in the ring. In the end Halstead got the nod with a split decision. In the 125 lb. weight class, newcomer Jen Hamann gained momentum for four rounds to win the close split decision over Rianna Rios. Jen’s third round, where she threw tough, hard shots and a lot of body/head combinations turned the tide for her, and by the fourth round she knocked Rios around enough to get her a standing eight. The veteran Bertha Aracil, who fought with a cool, lean style, cruised to victory in the 141 lb. weight class over Faith Franco to gain the championship. Another great battle was Danyelle Wolf’s effort with Fallon Farrar in the 152 lb. weight class. Both fighters came out throwing hard shots from the outset, but Wolf’s superior skills and ring generalship gave her the decisive win and the championship. Franchon Crews once again claimed victory of the middleweight title at 165 lbs. over teammate Raquel Miller. The spirited fight gave Crews the win and the chance to reign as champion. The 178 lb. weight class saw Tiffanie Hearn win the title over Dara Shen. Hearn fought at a fast pass and pushed her way past Shen to claim the championship. The new scoring system certainly has some kinks to work out, but as Tiara Brown noted, in training for it, the fighters have had the chance to execute truly remarkable performances. With these women on the roster of Team USA along with the young women who fought alongside them, there is a lot to be proud of looking ahead to Rio 2016! Congratulations to all the winners and to everyone with the heart of a lioness who took to the ring! 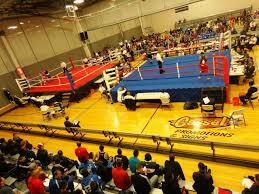 2013 USA Boxing Nationals finals set for 4/6/2013! Yet another USA Boxing Nationals is coming to an end on Saturday with two Olympians vying for titles along side newcomers and seasoned veterans. The event has not been without controversy given the introduction of a new scoring system and the change in the age categories which meant that Olympic gold medal winner, Claressa Shields competed in the Youth Women division. The Nationals is also the first major amateur competition allowing Elite Men to fight without helmets in years. This continues to raise serious concerns as the athletes may well face increased risks for head trauma and cuts — along with probing questions as to the motives for the change. Elite Women were excluded from this change — to the consternation of some — although in this case, exclusion might actually have been a good thing … for a change. The Semi-final bout between Tiara Brown and Mikaela Mayer has also been controversal. Brown was given the nod with a 2-1 decision, but there are those who feel that Mayer was “robbed.” One question to ask is whether the scoring is such that Mayer’s team is basing their complaint on what might have been a different outdome in the old system. Have a look at the video and you be the judge. The Finals action begins at 1:00 PM on 4/6/2012. You can also watch all the action live HERE! 2012 USA Boxing National Championships! First Women’s Bouts! 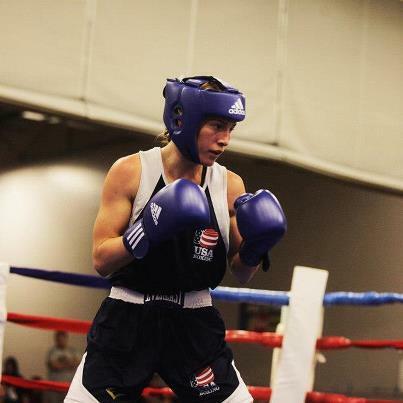 The USA Boxing 2012 Nationals got underway on February 25, but February 29th marked the first female bouts! Action included some fabulous fights by women who recently completed in the Olympic Trials including a win by New York’s own Christina Cruz fighting at 119 lbs. who took a 15-4 decision over Rianna Rios of Alice, Texas. California’s Mikaela Mayer moving up in weight to 141 lbs. won in retirement over Patricia Cuevas of San Antonio, Texas, while Yonkers, NY fighter Bertha Aracil pulled out a close win over fellow Olympic Trials teammate Lisa Porter of Northridge, California, 17-15. They also moved up in weight to the 141 lbs. class. In one of the big surprises of the yesterday’s preliminary round sixteen-year-old female featherweight Rashida Ellis of Lynn, Mass. stopped Olympic Trials lightweight participant from Washington, DC, Asia Stevenson in the first round to claim a spot in the quarterfinal round in the 125 lb. weight class. Another tough one saw Olympic Trials veteran Virginia Fuchs of Kemah, Texas losing a tough one against Ayanna Vasquez from Las Cruces, NM who took the decision by a score of 25-23. By the way, get set for a great one at the 11:00 AM session today when Gleason’s own Heather Hardy will fight her first bout of the competition against Olympic Trials hopeful Tiara Brown in the 125 lb. weight class. All bouts are streamed live — for a fee. The link is here. 106 lbs/female: Amy Sowers, Bozeman, Mont., vs. Cheyenne Candelaria, Albuquerque, N.M.
106 lbs/female: Nicole Pasillas, Aurora, Colo.,vs. Alex Love, Monroe, Wash.
125 lbs/female: Heather Hardy, New York, N.Y., vs. Tiara Brown, Lehigh Acres, Fla.
125 lbs/female: Kirstie Simmons, Aurora, Colo., vs. Jennifer Hamann, Seattle, Wash.
125 lbs/female: Amorena Baca, Denver, Colo., vs. Karla Herrera, Los Angeles, Calif.
119 lbs/female: Haley Pasion, Aiea, Hawaii vs. Ayanna Vasquez, Las Cruces, N.M.
119 lbs/female: Christina Cruz, New York, N.Y., vs. Carissa Morton, San Francisco, Calif.
119 lbs/female: Nephateria Miller, New Haven, Conn., vs. Melanie Costa, Norton, Mass. 119 lbs/female: Jamie Mitchell, Pacific Grove, Calif., vs. Amanda Pavone, Burlington, Mass. 141 lbs/female: Cashmere Jackson, Cleveland, Ohio vs. Bertha Aracil, Yonkers, N.Y.
141 lbs/female: Griselda Madrigal, Wenatchee, Wash., vs. Ariel Beck, Helena, Mont. 141 lbs/female: Jessica McCaskill, St. Louis, Mo., vs. Christella Cepeda, Yonkers, N.Y.
141 lbs/female: Mikaela Mayer, Los Angeles, Calif., vs. Luvisa Matali, Denver, Colo.
152 lbs/female: Tamika palmer, Pennsylvania vs. Raquel Miller, San Francisco, Calif.